The above lines are from a romantic poem by Sandra Lewis Pringle. 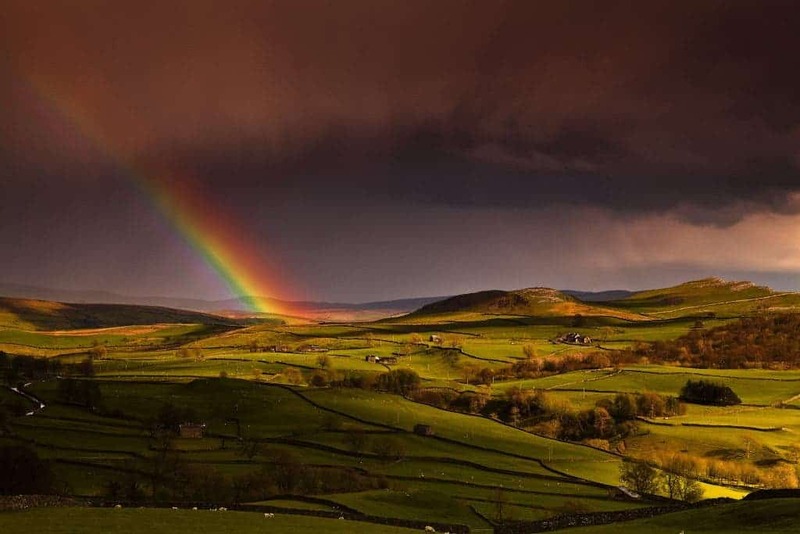 For thousands of years, rainbows were an enigmatic phenomenon that was out of reach to humans – they disappeared immediately after making an appearance! Scientists from around the world worked hard in search of breakthroughs to capture this beautiful natural phenomenon but without much success. One thing is certain – in order to capture rainbows, the art of manipulating light should be mastered first. This is exactly what engineers at the University of Buffalo did! The Buffalo team was led by Qiaoqiang Gan, PhD and his group of graduate students. Their work has been presented in the paper “Rainbow Trapping in Hyperbolic Metamaterial Waveguide“, recently published in the journal Scientific Reports. This significant development is a big leap in the field of photonics and keeps the door open for further developments in other realms such as solar and stealth technology. Light is made of photons that move at a tremendous speed and is difficult to control. Earlier attempts to capture rainbows by scientists revolved around using cryogenic gases that were 250 degrees below zero Fahrenheit. Prior to joining the University of Buffalo, Gan was instrumental in pioneering a method to slow light without cryogenic gases. 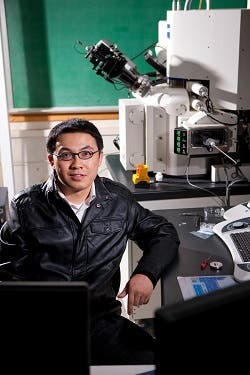 At Lehigh University, Pennsylvania, his team made nano scaled grooves on metallic surfaces. This process significantly altered the optical attributes of the metal. However, Gan realized that metallic surfaces were not ideal for experimentation and looked for other avenues. Qiaoqiang Gan, leader of the study. At the University of Buffalo, Gan’s objective was to make significant inroads in multiplexed, multi-wavelength communications wherein optical data could be trapped at different wavelengths. Gan’s team made this possible by using ultra-thin films that delays the passage of light and allows for its efficient absorption. They built a microchip made of metals, insulators and semi conductors that has the ability to halt and absorb different frequencies of light. Called the “hyperbolic metamaterial waveguide”, this microchip can capture near-infrared, terahertz, mid-infrared and microwave wavelengths. Qiaoqiang Gan had finally made capturing rainbows a reality! 1. As the perfect aid for energy harvesting devices: The microchip’s absorbing skills can be put to good use in energy-harvesting devices. According to Gan, his discovery will be ideal for devices that recycle heat post-sundown. 2. As a tool to prevent crosstalk during transmission: Crosstalk is an unwanted effect in electronics caused when a signal transmitted by one circuit or channel in a transmission system causes interference in another circuit or channel. Gan’s find will absorb all interferences and make transmissions clear. 3. As an important part of military technology: A powerful weapon like the Stealth bomber requires material that make ships, planes and other hosting devices invisible to detection methods that use infrared, radar and sonar technology. The discovery can also be used as a coating material to hide devices, thus making it a potent tool in military technology.